This year, Puri Rath Yatra date is on 14 July 2018. The festival is celebrated on the 2nd day of the Shukla Paksha. 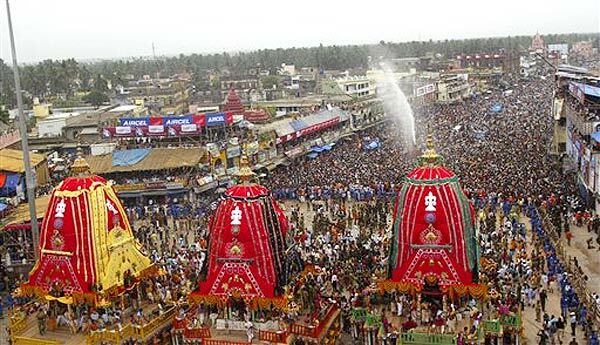 Ratha Yathra or Chariot Festival is a famous Hindu Festival held in the state of Odhisha at Puri. Jagannath Rath Yatra festival is dedicated to Lord Jagannath also known as Lord Krishna, Lord Balaram and Goddess Subahdra - sister of Lord Krishna.The whole event symbolysis Lord Kirshna visiting his birthplace Madhura and the yathra is conducted each year from Jagannath temple to Gundicha temple. It is one of the oldest procession festival in the world. Lord Jagannath’s Chariot called Nandighosa has 18 wheels and with a height of 45.6 feet. Lord Balaram's Chariot called Taladhvaja has 16 wheels and 45 feet height and Goddess Subahdra’s chariot called Devadalana has 14 wheels and 44.6 feet height. All chariots are beautifully decorated by Puri artists with different designs and paints.